This post, Bacon Herb Oven Roasted Turkey, is sponsored on behalf of The Diestel Family Turkey Ranch. All opinions are, as always, my own. Thank you for supporting the brands that help make Jelly Toast possible. If ever there was a holiday meant to celebrate food traditions, it’s Thanksgiving. Over the years, I have shared my family’s Thanksgiving traditions. On Thanksgiving Day, my family gathers at my parent’s house where my mom prepares a huge turkey and we all bring our favorite side dishes to share. I bring my beloved sausage filling and sometimes I’m in charge of the cranberry relish. My sister-in-law brings her amazing sweet potatoes and my grandma brings the pumpkin pie. A few dishes vary from year to year, but the base of the meal remains steady and unchanged which is perfect for such a food-centric holiday. One of my favorite parts of our Thanksgiving tradition, however, happens the day after Thanksgiving. While many folks are heading out to stores to indulge in Black Friday shopping, our family of four is settling in for our mini-Thanksgiving and a day of decorating the house for Christmas. 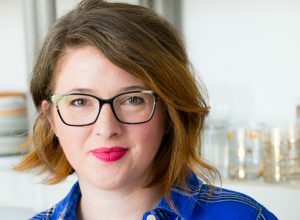 For as long as my husband and I have been married, we have dedicated the Friday after Thanksgiving to making a smaller Thanksgiving feast that will provide us all of the coveted leftovers we crave but are hard to come by after our big Thanksgiving day dinner. You see, when we get together with 20-30 people on Thanksgiving, the food is fantastic, but so much so, there are never many leftovers to go around. And honestly? Thanksgiving leftovers are one of the best parts of the meal! Pair our second Thanksgiving meal with a day full of Christmas decorating and it’s pretty much my definition of a perfect day. When I plan our day-after-thanksgiving meal, I typically plan for a smaller size for every dish involved. This year, I’m preparing an amazing Bacon Herb Oven Roasted Turkey using an Organic Oven Roasted Turkey from Diestel Family Turkey Ranch. These oven roasted turkeys from Diestel are plump, juicy, and full of the traditional turkey flavor that we crave but is often hard to come by with a conventional turkey. I recently had the pleasure of speaking with Heidi Diestel, one of the members of the four generations of the Diestel family who has been raising turkeys since 1949. The Diestel Family Turkey Ranch is located in Sonora California, and they pride themselves in sustainable farming practices. They feed their turkeys with 100% vegetarian diets and all of their turkeys are thoughtfully raised and harvested. The Diestel family also raises a variety of turkey breeds and allows them all to slow grow to their natural size. Their turkeys are raised for about twice as long as conventional turkeys. Before speaking with Heidi, I had no idea that there are special petite breeds of turkey that, when fully grown, are only 6 pounds! These birds are allowed to mature fully and naturally which results in delicious, meaty birds with traditional turkey flavor. This year, I am proud to be serving my family a Diestel Organic Oven Roasted Turkey which arrived fully roasted. 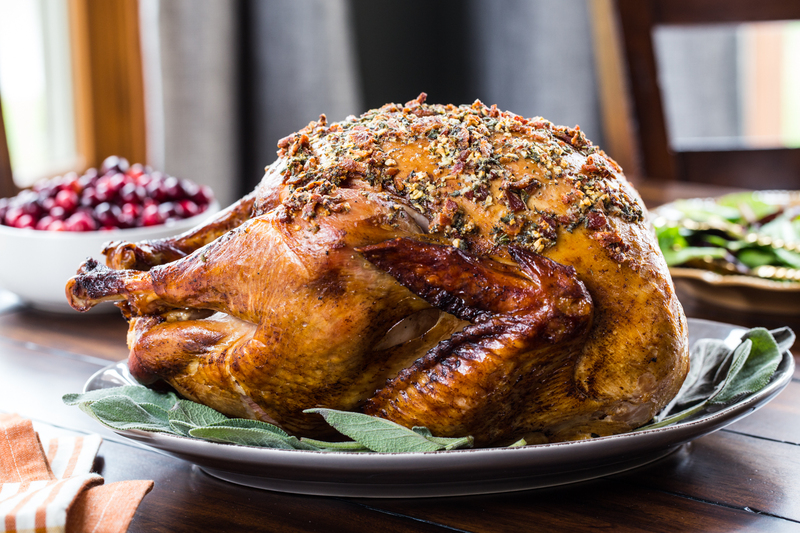 All it took was a few days thawing in the fridge and a gentle reheating in the oven to create a fabulous bird in a fraction of the time of a fresh turkey. 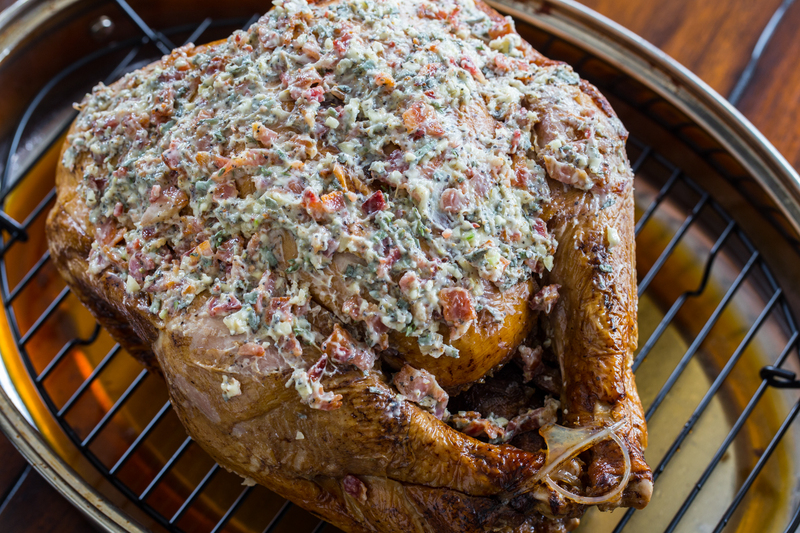 I adapted my roasted turkey breast with bacon and herbs recipe and created a bacon herb butter to add even more flavor to this already juicy flavorful bird. I simply used butter, bacon, garlic, and a handful of herbs. The method is simple but the results are amazing! 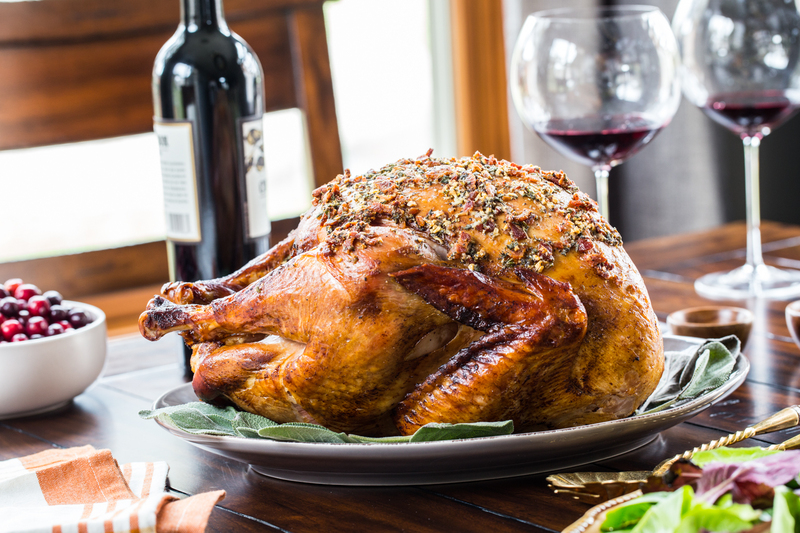 In addition to their amazing Organic Oven Roasted Turkey, the Diestel family produces traditional fresh turkeys such as their Organic American Heirloom Turkey, their Pasture Raised Turkey, and their Original Diestel Turkey. The Diestel family also offers fantastic turkey sausage and deli products that are available year round. The Diestel Family Turkey Ranch has a new online store complete with a Thanksgiving turkey variety for everyone and they have offered Jelly Toast readers a generous $12.00 off of your Thanksgiving turkey order between now and November 14th. Just use the coupon code JELLYTOAST12 at checkout to receive your discount. 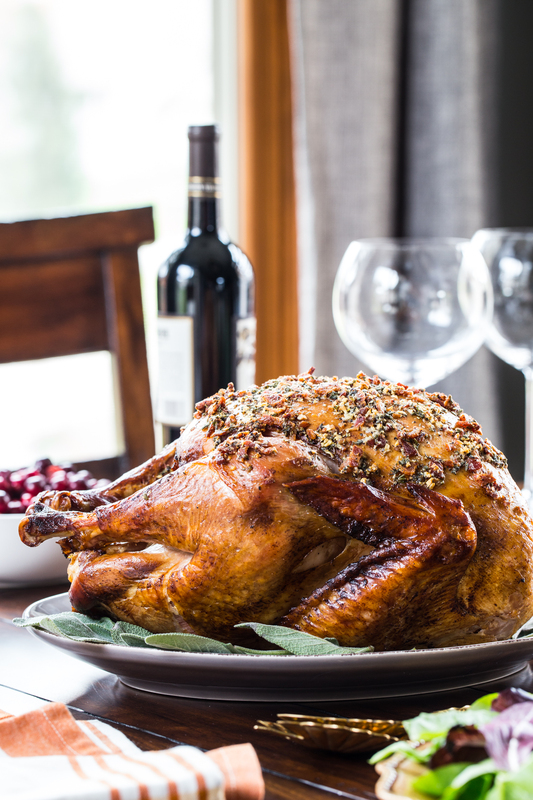 Order your turkey now and pick a delivery date to receive your fresh turkey ready to prepare for your family’s Thanksgiving feast! 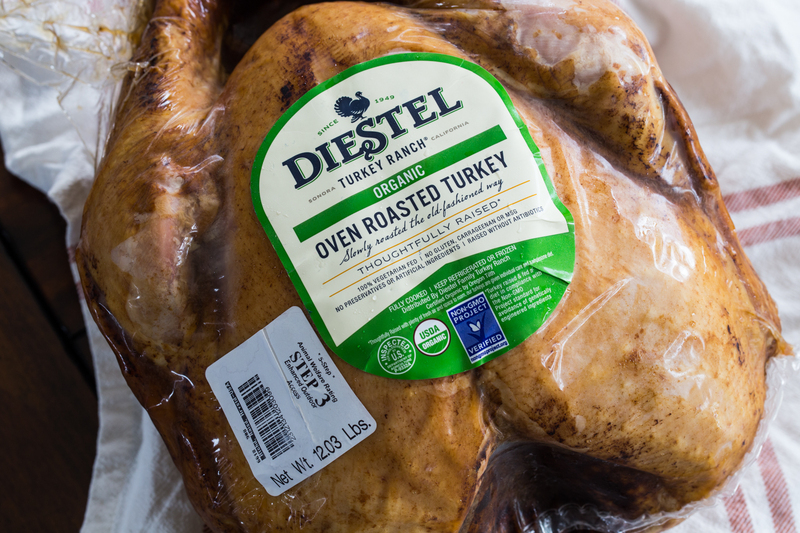 Remove Diestel Organic Oven Roasted Turkey from bag and place on a rack set inside a roasting pan. Set aside. 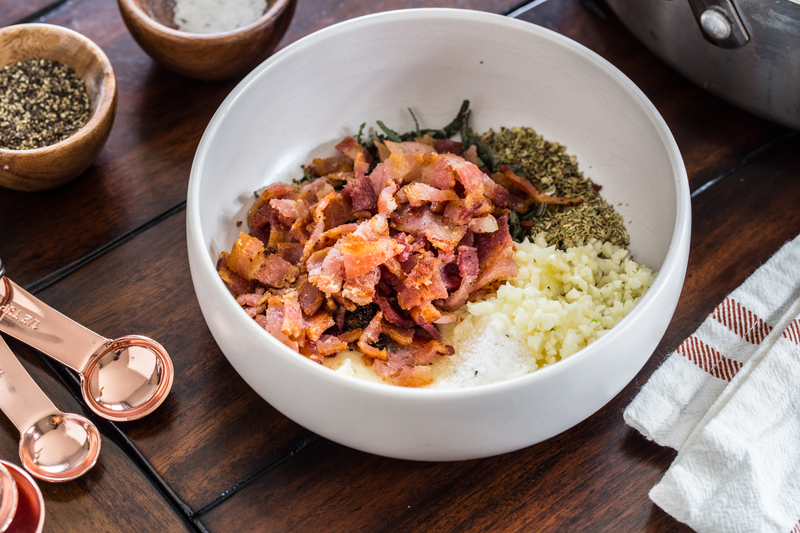 In a medium size bowl, mix together bacon, bacon grease, butter, thyme, rosemary, oregano, sage, garlic, salt, and pepper to create an even mixture. 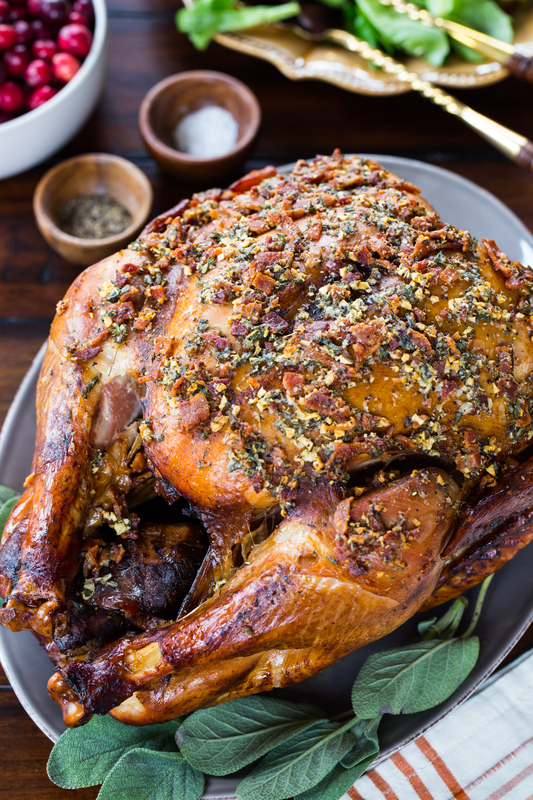 Spread bacon herb mixture evenly over the breast and legs of the turkey. Heat turkey in oven for 1 1/2 hours (or according the package time indicated on Diestel Organic Oven Roasted Turkey). Remove from oven, tent with foil and allow to rest 10 minutes before slicing and serving. 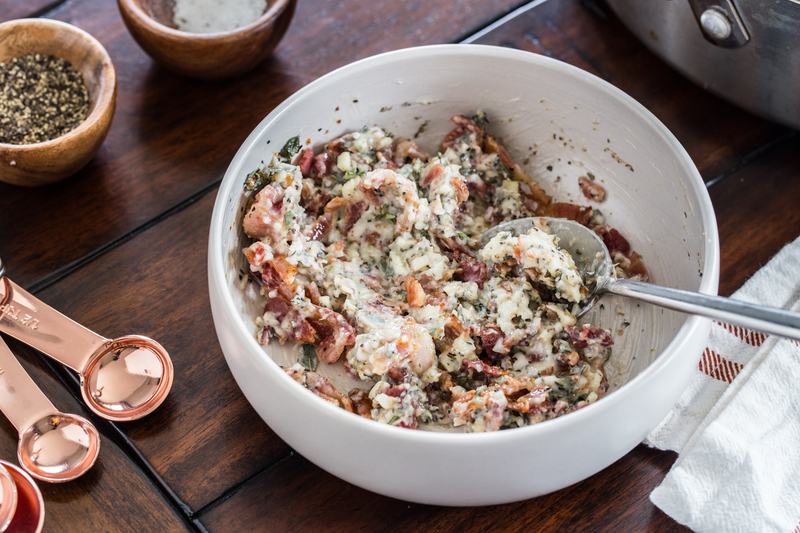 I am exactly like you – sometimes the leftovers are even better than the meal itself! I plan on making some favorite Thanksgiving dishes over the next few days to enjoy before the family feast! Could you do this with a chicken? If you’re cooking it yourself (as opposed to how this game fully roasted), what would you recommend?